The Carolingian Guild of Musicians and Jongleurs is a chartered guild of the Barony of Carolingia, the Boston-area branch of the Society for Creative Anachronism, Inc. (SCA). The purpose of the Guild is to encourage and nurture SCA-period ensemble music -- that is, pre-17th century ensemble music from Europe or areas that communicated with it -- in the Barony, and the SCA at large. The Guild runs two major ensembles, the Waytes and the Quire, and has room for other groups focused on some specific aspect of SCA-period music as interest warrants. The Waytes are an instrumental ensemble functioning primarily as a Renaissance dance band. 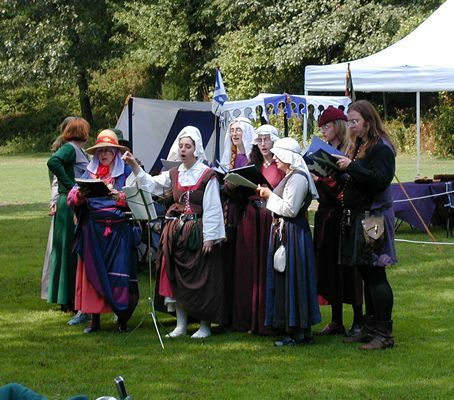 The Quire is an a capella vocal consort which sings music from throughout the SCA period.